I am forever a Buffy fan and Spike definitely my favorite character. Glad when Spike showed up on Angel. Husbands is hysterical, if you haven’t watched it you should. As for my favorite Show that currently would be Once Upon A Time. loved Caprica, not sure what happened, although a character I loved was killed off in a way that seemed out of sequence or just odd (Barnabas). Warehouse 13 is on my always watch list. Now that I think of it I am a fan of all the shows mentioned. Hey wait, is there such a thing as an Espensonite? LOL. P.S. Also enjoy the writing sprints on Twitter! I took my daughter to see ‘Spike’ at a convention. She was only 4 and ended up on stage with him. Have some fabulous photos. I will have to dig them out. Whoa, she’s a rockstar! So many of the shows she’s worked on are my favorites and you have her on your blog. You’re a rockstar, too! I don’t know how you do it, but you get the best people for this gig. You’re telling me! She kept chatting to me via email. I can honestly say she is one of the nicest people I’ve ever met. I loved the O.C.! I have them on DVD, well all apart from season one. That disappeared on me. I’ve never seen the Gilmore Girls though. I imagine it was good. I am looking forward to the UK airing Once Upon a Time. That looks right up my street. 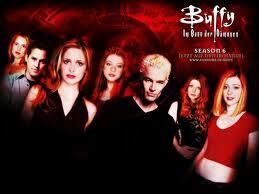 Loved Buffy! 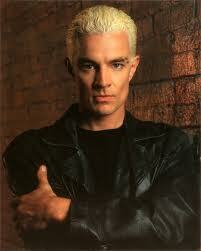 I think Spike was my fave though. I liked his complicated relationship with Buffy. And Gilmore Girls is a show I can watch endlessly in reruns, something about those quirky small town characters!